I have a road layer, with two locations points. I have created a shortest path analysis between these points. Now, I would like to delete some segment from the road network. I would like to delete (some) segments that the shortest path (displayed in bright red) lies on. Once this lines are deleted, I want to run the shortest path again.I want to do this in order to have two "shortest" paths that I can compare later on. I have tried to create a multistring, then edit, select segment and delete. However, the segments remain in the layer. How can delete segments, so my second shortest path analysis run through a different route? OK, I have been over thinking things when I posted the question. Removing segments from a road networks is much easier than that. select all parts of the network you want be removed. Be careful, some streets might extend outside of the polygon once selected and you might removed something you did not intent to remove. Go to attribute table. Invert Selection. Right click on the road network layer in the layer panel and save as.... Under encoding, tick the box Save only selected features. 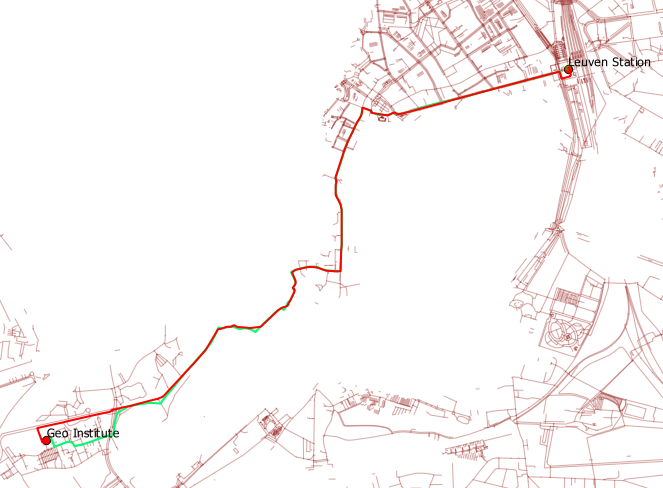 Go to Vector|Road Graph|Settings and change the transportation layer to the layer you have saved in step 5. Thats it. The final output looks like. There is some potential form improvement arount the location point Geo Institute, but this is good enough for illustration purposes. The method you tried won't work because it's still the same single feature, even if you add/remove vertices. You need to first split the feature you're trying to modify, then delete the segment(s) that you no longer want included in the path analysis. See my previous answer on splitting features using the advanced digitizing tools to do this. Not the answer you're looking for? Browse other questions tagged editing shortest-path multipart delete singlepart or ask your own question. How to Split Features in QGIS? Getting All Paired Shortest Paths in ArcGIS network analysis at once? Why modelbuilder does not give the actual result? How to find shortest paths between one destination and multiple origins in ArcGIS? QGIS 3 Shortest Path: batch processing?